Do i need to setup virtual machines? Apparently a merlin knows how? 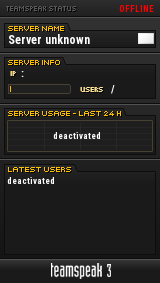 leme know or shoot me a teamspeak ip ill jump in n chat if someone can help. Since the CMD window closes, you might want to create another .bat in the directory that runs the server and then below that line in the .bat put "pause" so it doesn't close the window automatically, then you'll be able to see what the error and reason for closing is. Avoid spaces, or enclose the whole path with double quotes ""
Yea, quotes and no "cd" should work. Or you could rename the folder to 25Assist2 to solve it. Niceee I think its working. I was going to ask about updated but it looks like it automatically downloads new maps and changes i guess eh? Think something is still off, it appears in the list but dont think you can join it. the port is open in router - ip is 1726 instead of 1716.
do i need to change the other somewhere as well? - 1717? Or isnt that the game query port should be able to run off the same?